I'm going to briefly touch on a subject over the next few paragraphs that for most part is completely unexplainable with salmon flies and sometimes even River Tay 'harling' lures regarding their effectiveness in the stream. Complete faith in a specific individual fly or lure is a rare commodity which is well worth treasuring. Over the decades of being professionally involved in this business I've seen certain individual flies and lures work far more consistently than an exact replica of the same lure or fly. I've seen this to a degree that when you find one like this you should treasure it and never consider giving it away or on loan to another angler as they are like hen's teeth! A Switch To The Killer Fly & Bang! I've seen myself out with a replica of the same fly pattern on many occasions covering fish with no sub surface contact to then switch to the 'proven' identical equivalent and more or less straight away getting into contact with a salmon. The only thing I could put it down to is that possibly the scent of a fish stays on the fly and becomes an additional attractant but that's my best shot at explaining this very strange phenomenon as to my eye both patterns would be identical. The same thing however is noticeable on River Tay 'harling' lures and certain individual lures work far better than apparent replicas of the same model. With a plastic moulded lure like a Kynoch or a Tomic for example there could be an internal unseen difference to that lure created in the moulding process that alters the action of the lure but there's definitely something in it and like a salmon fly equivalent this is truly unexplainable. As another example of this I personally have hundreds of plastic Tay 'harling' lures but when venturing out onto the river the selection would narrow down to less than half a dozen. Those lures would be the most 'battle scarred' old scabby bangers in my entire selection range. Even if one of them is fished on its own on any 'harling' rod that is the lure 99% of the time a salmon will take even if it's fished on the shortest line which means that salmon is very likely seeing it last and not first! My advice on this if you've spent enough time on the river to witness some of the above is once you've got a fly or lure that's working consistently hang on to it with both hands. 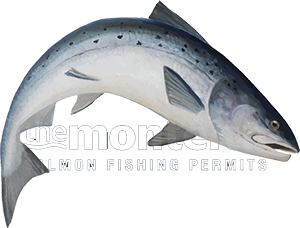 With success on any salmon river brings curiosity from other anglers so you'll probably always feel compelled to let a curious angler borrow one of your favourites. On occasions I've done that to see that particular proven fly not offered back or having been completely ruined due to a bad casting technique so my advice is don't do it. Just to add a bit more to this article one of my best River Tay salmon guide colleagues Steve McIrvine always uses the same big salmon tube fly while 'harling' from the boat. This Ally Shrimp 'Cascade' style of pattern absolutely nails Spring, Summer & Autumn salmon and this year produced springers up to 34 lbs for his beat. The mentally disruptive part of this for any straight thinking salmon fisher is that the Summer grilse cannot leave this big tube fly alone either while the rest of us are all out fishing sparsely dressed size 11's!